I can't believe it, Square Enix finally released something Taito related internationally after they absorbed Eidos Interactive. This game is definitely worth the price of admission, one payment and you get everything, no micro transactions involved. It's a haven for Taito fans! So yeah, Taito was a heavyweight in the arcade days with Sega, Capcom, Namco and Konami. But once HD gaming came into play, Taito had an awkward transition to consoles. 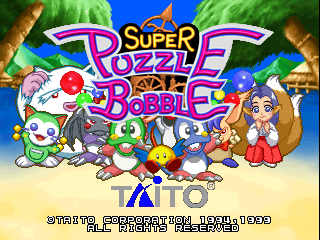 When Square Enix was looking to expand their company into new avenues, they decided to acquire Taito, Taito has Square Enix has its distributor whilst Taito became the arcade division of Square Enix, a mutual benefit. Damn, I remember playing the Lufia games (and the boring remake for the NDS). I really wish Square Enix would release physical compilation discs similar to Taito Memories with perfect arcade emulations/ports of the entire Taito games library. Preservation of video game history is just as important as that of movies and music. And I think Psychic Force has so much potential for a reboot. Puzzle Bobble fan here (lol who isn't?) and bought Bust-A-Move Universe for the 3DS back in 2011. Not the same touch with Akira programming the game. 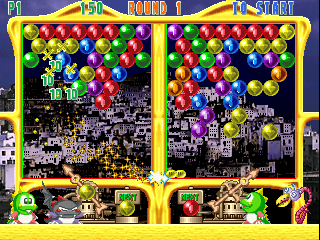 I have that one as well (it was called Puzzle Bubble Universe here in Europe). It's pretty good, albeit basic. Not a big fan of the 3D stages, but it could have been much worse. Square Enix should release Lufia and Lufia II for the Nintendo Virtual Console. Wait, how come the remake was boring? I personally loved the character redesigns (though I didn’t play the game). Glad to know that Taito isn’t entirely obscure. And I completely agree. Taito needs to be preserved as they were pioneers of the arcade era with the games that you mentioned. Square Enix did mention an initiative to revive dormant franchises. There’s a bunch of Taito franchise that need a modernised reboot for the contemporary gaming generation. And Psychic Force. I couldn’t have asked for a more appropriate intellectual property to gain a reboot. Square Enix have barely dabbled in the fighting genre outside of Dissidia (which is more of a mashup Final Fantasy franchise if anything). Psychic Force seems to be the perfect IP to be treated with a modern take. I'm simply perplexed as to why Taito never developed for it? have they been relegated to arcades ever since the acquisition? Because if so, that's really stupid on your part Square Enix. So yeah, Square Enix remembered that they owned Taito and decided to do something with the intellectual property after all these years. I'm so thankful that this isn't a free-to-play game despite the opportunities that presents itself as one. This game is so good, I hope that Square Enix revives more Taito intellectual properties!